How to beat the heat–lime. It’s 104 degrees in the city today, and when it comes time for lunch. I’m thinking something refreshing, something tasty, something seasonal, something tropical. Lime. Cocktail first: a martini glass of light rum with crushed basil and lime. Times 2. First, a bruschetta spread with whipped ricotta and fava beans topped with a think slice of jalapeño. Entrée, steamed hake with asparagus and an onion-chile vinaigrette (and lime). For a side we had sautéed corn topped with manchego cheese, jalapeños (and lime). 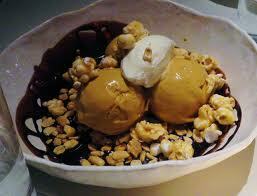 Finally, dessert was a salted caramel ice cream, topped with candied popcorn, chocolate and whip cream. Alas, no lime. 2 Responses to How to beat the heat–lime. Make mine a double I’ll be there in an hour. Next time you come down! How are you all dealing with the heat? The beach?